When It Comes To Smartphones, Are Americans Dumb? 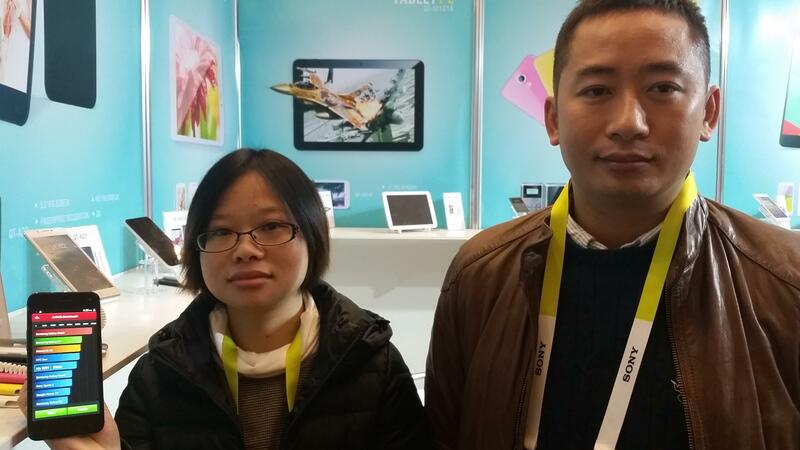 Irene Chen and Longlai Zuo, with the China-based company Quality Technology Industrial, show off their top-line phones, which cost about $100. China-based phone-maker Xiaomi has grown so quickly that it's now the third-largest smartphone manufacturer in the world. As you might imagine, there are smartphones everywhere at the International Consumer Electronics Show in Las Vegas this week. Tonino Lamborghini [a company not related to the famous car brand] has a new phone out for $6,000. Samsung's Galaxy series is on display in a dazzling showroom. But these high-end phones are not the force driving global sales. You'll find that in a little corner of this massive expo: the Asian wing. It took just 30 minutes of speed walking (the convention center madness here spans a few million square feet) to finally reach it. The space has a little smartphone alley, filled with cramped, boxy booths rented out by some of the world's leading manufacturers — companies you've never heard of, like WeiHeng Digital Co. Ltd., Quality Technology Industrial Co. and Shenzhen GBD Electronics Co.
All these vendors are here at the show for the first time. They've been building customer bases in Asia, Africa and Europe. Now, they say, it's time to hit the U.S. market. I go booth to booth, asking vendors to show me the very best phones they've got. The phone Gandolf Guan of WeiHeng is holding costs about $110. It's the same size as the iPhone 6 Plus, though it doesn't bend (I tried). And with its "smart awake" feature, you can swipe the screen with your finger to awaken it from sleep mode. You can swipe "C" for call pad, "E" for email or "M" for music, but it's up to you — "you can make the definitions by yourself," Guan explains. The phone's camera is high-resolution with 16 megapixels, just like my Samsung Galaxy S5. And this phone has a feature mine does not. Guan pops open the back to show me: It has two SIM cards, not one. The SIM card, a chip the size of a fingernail, is used in most of the world outside the U.S. You can pop the card, which is associated with a specific carrier, in and out of one phone and put it in another. So with two SIM cards, you could switch back and forth between carriers and save money, Guan says. Say Verizon is your main provider, but T-Mobile is having a big promotion. Guan says you could use both SIM cards from different operators on just one phone. I have several conversations like this one in the Asia wing. Irene Chen with Quality Ltd. tells me that her $100 phone is not cheap. "It's very smart," she says. "Let me show you." Chen grabs her best phone and launches AnTuTu Benchmark, an Android app that diagnoses a phone's specs like its speed and its memory. And it's true: This phone's ranking is on par with leading models. When many of us see the label, "Made in India" or "Made in China," we think it must be bad quality. But Chen points out, "As you know, almost all the phones [are] made in China. Like Apple. It's made in China also." The vendors at the Asia wing make a good sales pitch, but they've also got money at stake. So I wander through the convention in search of experts who don't — and find Greg Harper. He's the kind of rigorous (or obsessive) expert you wish were whispering into your ear while you're phone shopping. "In terms of smartphones, I have 28 active [phone] numbers," Harper says. "And I have no idea how many actual phones I own. It's in the hundreds." Harper swears by his Asian phones. "The [Xiaomi] Mi5 is a very, very good phone, and the OnePlus. Those are the two phones I'm using right now," he says. His favorites cost $300 to $400 — about half the price of a top-end, unsubsidized Apple or Samsung, and he says they're just as good. They run on Android, so you can use all the same Google apps. Korea-based Samsung is, in fact, taking a beating on its home turf. Because it was so focused on Americans who'll spend a lot of money, it lost the huge market in Asia. One company called Xiaomi has risen so fast it's now the third-largest smartphone-maker in the world. Harper says Americans aren't paying for quality — they're paying for brand. "Are American consumers dumb when it comes to how we buy smartphones?" I ask him. "We're very dumb," he says. "Because we've been caught up in the whole marketing blitz." 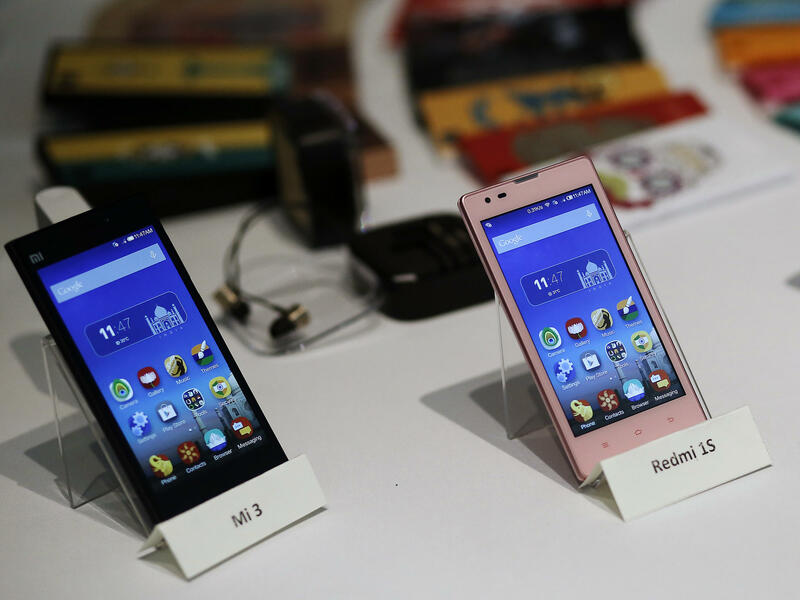 The Asian phone-makers at the show say they're fighting over pennies back home. In the U.S., with prices so high, they can grab dollars. In Las Vegas this week, at the International Consumer Electronics Show, a big surprise - there are smartphones everywhere. Samsung's Galaxy series is on display in a dazzling showroom. Lamborghini, the sports car brand, has a new phone out for just $6,000. [POST-BROADCAST CORRECTION: Tonino Lamborghini (a company not related to the famous car brand) has a new phone out for $6,000.] But high-end phones are not what's driving global sales. And to find out what is, NPR's Aarti Shahani went to a little corner of the massive expo. AARTI SHAHANI, BYLINE: It took me just a half hour of speed walking to finally get to this place in the Westgate Hotel. SHAHANI: It's the Asia wing, and it's got a little smart phone alley with cramped, boxy booths rented out by some of the leading manufacturers that you've never heard of. UNIDENTIFIED MAN: WeiHung Digital Company Limited. WeiHung. UNIDENTIFIED WOMAN #1: Quality Technology. UNIDENTIFIED WOMAN #2: Our company is Shenzhen GBD Electronics LTT Co.
SHAHANI: All these companies are here at the show for the first time. They've been building customer bases in Asia, in Africa and in Europe. And they say now it's time to hit the U.S. market. I go booth-to-booth, asking vendors to show me the very best phones they've got. GANDOLF GUAN: For example, we have a very special touch panel we call smart awake. SHAHANI: Gandolf Guan is showing me the smart awake feature on a phone that's about $110. And when it's in sleep mode, you can swipe a letter with your finger to awaken it. Swipe C to get your call pad, E for e-mail. GUAN: M for music. You can make the definitions by yourself. SHAHANI: We take pictures with the camera, it's high-resolution 60 megapixels, just like mine only this phone has another feature. Guan pops open the back to show me. GUAN: Samsung Galaxy has only one SIM card here. But for our phone, you can see from here we have SIM one, SIM two. SHAHANI: The SIM card is a memory chip used in most of the world. In the Asia wing, I have several conversations like this one. Seller Irene Chen tells me that her $100 phone is not cheap. IRENE CHEN: No, no. It's very smart. Let me show you. SHAHANI: Chen launches AnTuTu Benchmark. It's an Android app that diagnoses the phone's specs, its speed, its memory. CHEN: This is our phone score. CHEN: As you know, almost all the phones are made in China. Like Apple - it's made in China also. SHAHANI: The vendors at the Asia wing make a good sales pitch. But they've got money at stake. So I wander through the convention in search of experts who don't. And I meet this guy. GREG HARPER: My name is Greg Harper. I'm president of Harper Vision Associates. And in terms of smartphones, I have 28 active numbers. SHAHANI: Harper is the kind of rigorous - or obsessive - expert you would want advising you. And he too swears by his Asian phones. HARPER: The Mi5 is a very, very good phone, and the OnePlus. Those are the two phones I'm using right now. Are American consumers dumb when it comes to how we buy smartphones? HARPER: We're very dumb. We're very, very dumb in how we buy smartphones because we've been caught up in the whole marketing blitz. SHAHANI: The Asian phone makers here say that back home, they're fighting over pennies. In the U.S., with prices so high, they can grab dollars. Aarti Shahani, NPR News, Las Vegas. Transcript provided by NPR, Copyright NPR.